If you want to know what real, live jurors have to say about witnesses, judges, and lawyers, then this is the book for you. James Stanton and Trey Cox articulate ten rules every trial lawyer should know and use every time he or she appears before a jury. These are not lawyer rules, these are The Jury Rules. The Rules are based on hours and hours of actual juror responses in post-trial, videotaped interviews. Before your next trial, arm yourself with The Jury Rules. 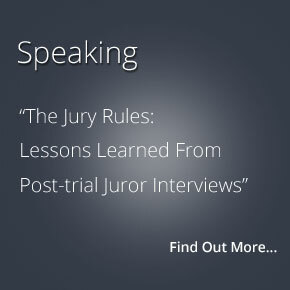 The Jury Rules are derived from over twenty-five hours of post-trial, videotaped interviews with real jurors. Each of the ten rules is explained and supported with specific quotes straight from jurors. For lawyers who want to improve their courtroom presentations to juries, these rules are the place to start.